Cezanne's John Daugherity took the DIY ethic to the max with his latest release. 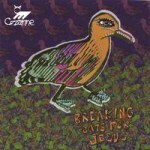 Cezanne’s John Daugherity took the DIY ethic to the max with his latest release, Breaking Bats For Jesus. Not only did Daugherity record and produce the album, but he even made the cover art! Cezanne started as Daugherity’s solo project until he eventually recruited members from Craigslist.com to play live gigs (Craiglist, our where would we be without you?). BBFJ is minimalist indie rock that swaggers like a lo-fi Interpol with a hint of shoegazing. The lazy, distorted "I’ve Got So Much" features Daugherity harmonizing with himself to the tune of a languid, bass-heavy riff. His voice is intentionally drowsy during the verse, but then soars on the chorus. Lamenting an ill-fated love on "In Snow", Daugherity moans over a light drone and a fuzzy lo-fi riff. The album gets a bit repetitive toward the end, especially the six-and-a-half minute "Hell’s Bells", but it’s an impressive effort from a guy would couldn’t get signed and decided to do everything (and I mean everything) completely on his own.